• Create the "editor data" folder if it doesn't exist. • Start new save-game with this database selected. Select new game and bottom right there is a box to choose All, None or Custom. Custom allows you to choose one file, All selects all in the editor data folder so choose accordingly. Co-owner of "The Football Manager Whizzkids" Facebook/Twitter page. Newcastle United fan. Follow us @TheFMWhizzkids. 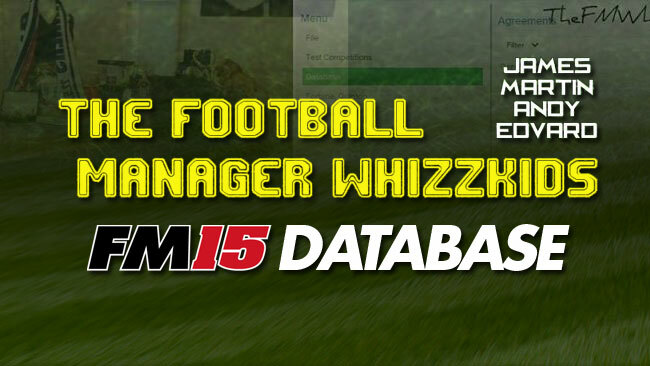 Discussion: The Football Manager Whizzkids 2015 Transfer Database Update - 01/10/2015. 98 comments have been posted so far. hi quick question i just dowloaded this and chose 7zip to open it but it just said it cant and now the file has the 7zip logo and i cant do anything with it any idea what ive done wrong? @InfraRed Didnt do that this year as i didnt exect to add 45 potential wonderkids. Next year i will though. @burakjimmy Done now, thanks for letting me know. nice work getting this out so early! is there a list anywhere of the new wonder kids? @guyUdownbb Ok, first of all, i do this as an individual, secondly, im from a very small town in Scotland and can not cover every single transfer - That is impossible (my knowledge of Portugal is not fantastic, but is your knowledge of UK Football as good as mine? No). @jatecn This is because you have other databases installed, can only use one at a time. @afari Read above comment. Tell me these MAJOR TRANSFERS? There are not many databases creators out there, i have put 400 hours into this form people to complain about small transfers in Portugal. Try it yourself? At least i know we are appreciated by some. It seems whizzkids have rushed this update. I see you have updated the major leagues and the most known transfers but other leagues are still to update.. Like someone said before, the Portuguese league is completly wrong. Transfers that were made almost 2/3 weeks ago aren't updated. This update on my FM 's time to start a new save is not being able to score several leagues , such as English, Spanish , Italian , etc. why is this happening ? Essa atualização no meu FM na hora de iniciar um novo save não está podendo marcar diversas ligas, como : inglesa, espanhola, italiana e etc. porque está acontecendo isso ? James if you need the update in Portugal tell me and i can help you (im portuguese). A Scotsman like myself can not possibly cover all of Portugal. Re-check database, download again. can you edit the turkey super league/fenerbahce ? some transfers missing. I understand the CA/PA point. BTW, Lanzini is in the latest DB and in the first team squad. @Ricey Thanks, i never noticed the second Oscar Borg, which SI must hae added him in there last patch as he was not there when i created him many months ago. I do not change CA/PA, because it is based on opinions, not facts and who is to say my opinion or anyones would be good judgement, although some i clearly would agree with. Possibly right with Joey Barton but i usualy state if the deal is not done within 2 days of release, i will remove him. He is currently the only one ive gotten ahead of myself with. @meddy Are you sure? Using another database? Check u21s? He is there with an £8m buy clause on mine. Hi mate ty for the database and all your efforts thus far. I just downloaded the DB and started with West Ham. I noticed you have two Oscar Borgs in the u18's. Also, I think Samuelson needs a boost in PA and maybe a little extra in CA (Especially technical) after his free transfer from Man City. One last Thing, Joey Barton is training with the squad but has not signed ,,,, A decision will be made later in the week with the rumour he is considering a pay as you play contract. A tad early to include him in your database? Lierse: Degrated to 2nd division. 1. Great work! Keep these awesome updates coming! 2. is there a changelog? to see which transfers are included every update? Handcrafted in Symi, Hellas. Page created in 0.632 seconds.